An Irish auctioneer has defended the decision to sell a decommissioned rocket launcher similar to those used during the Troubles. 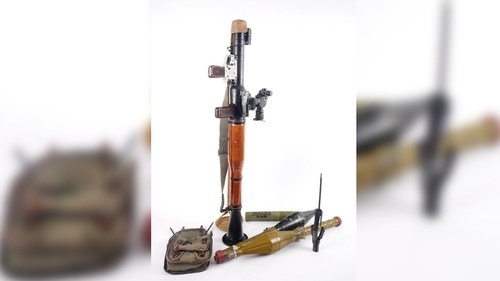 The RPG-7 rocket launcher is being sold with two inert rocket-propelled grenades, inert booster rocket and accessories. It is estimated to reach between €4,000 and €6,000 when offered at Whyte's Auctioneer's 'Eclectic Collector' sale on 6 April. According to the Whyte's catalogue, the Bulgarian-made weapon was decommissioned in Birmingham in 2013. The catalogue says the RPG-7 was "used by the Provisional IRA in Northern Ireland from 1969 to 1998". Speaking on RTÉ's News at One, Ian Whyte said the company sell weapons dating back to the beginning of time. He said this particular weapon comes from a collection belonging to a republican collector. Mr Whyte said "it is part of history", adding that a number of similar firearms have been bought by museums like the Ulster Museum. "We sell all sorts of weapons once they are decommissioned and can't be used again," he said.